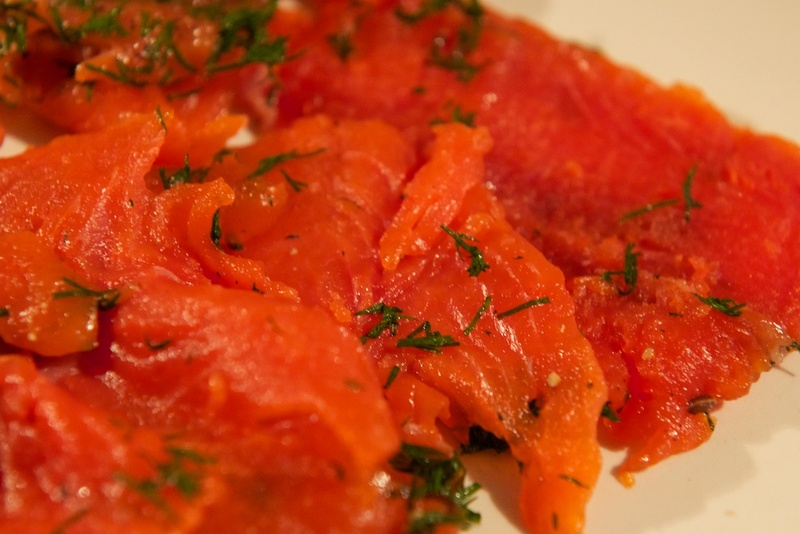 Lox is salmon that has been preserved by curing, and although the word is sometimes used to refer to smoked salmon, it is really more properly used to to describe salmon preserved through brining. 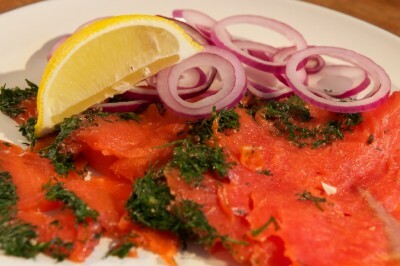 There are many different salmon cures used around the world, but one of the best known is the Scandinavian gravadlax. 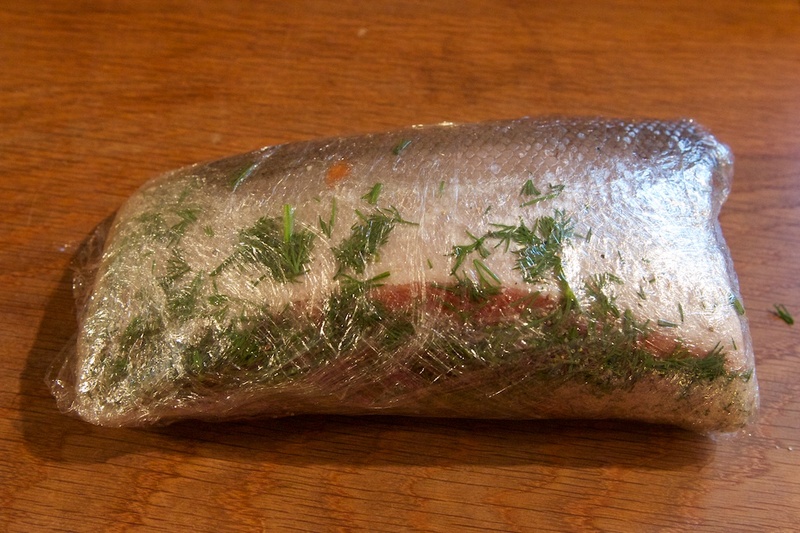 I’m rather fond of gravadlax, so that’s the one we’re going to use here to make our Lotsa Lox. You need two salmon fillets, each about the same size and shape. Get the best salmon you can afford, and as fresh as you can. Don’t go for the cheap stuff that’s on offer – remember, we’re going to eat this fish raw. Go to a reputable fishmonger and get something decent. The quantities will depend on how big your salmon fillets are. 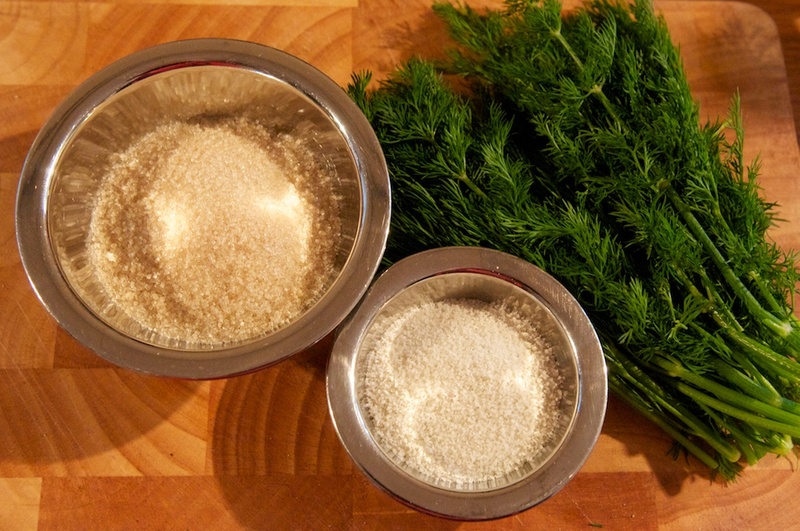 You need enough salt and sugar to generously cover the two fillets (with one part salt to two parts sugar), and a generous bunch of dill (don’t skimp on the dill, it’s the main flavour here). 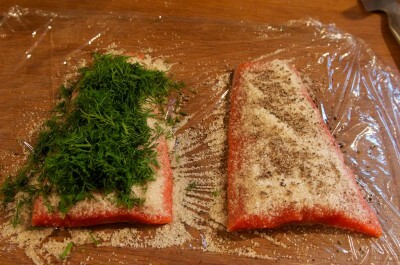 Lay out a large piece of cling film and place the two pieces of salmon, skin side down, side by side on top. Make sure the two are the same way around as we’re going to sandwich them together in a moment. Cover each salmon fillet with the salt/sugar mix, together with freshly ground black pepper and a sprinkling of dill seed, and then place a thick layer of chopped dill onto one of the fillets. Now for the tricky bit. You need to sandwich the two halves together without spilling any of the toppings. I find that the best way is to manoeuvre your hands underneath the cling film and in one smooth, swift motion, bring the two pieces together. Once together, bind them up tightly in the cling film, using more if necessary. 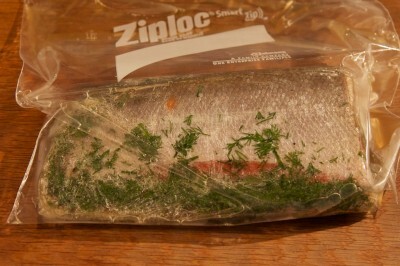 Next, I usually place this bundle into a Ziploc bag in order to catch the brine that inevitably leaks out. If you don’t have a Ziploc bag, make sure you place this in a suitable dish. Put the salmon in the fridge, and place some weights on top to press it flat. For weights, you can use whatever you happen to have to hand. You can use a rock from the garden, some tin cans – I just use whatever happens to be in the fridge. Now wait. Leave the salmon in the fridge for seven days. Each day, you should turn the salmon package over and weight it down again. After a week, it will be ready. Carefully unwrap the salmon. This is your solid piece of gravadlax. Next, slicing. 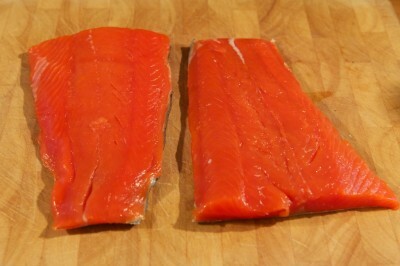 Separate the fillets and using a sharp knife cut into slices. The slices should bemade at a very shallow angle – almost parallel to the chopping board, and fairly thin (about four or five millimetres). Arrange the gravadlax slices on a plate. Place the onion slices on the side and garnish with the wedge of lemon. Eat. 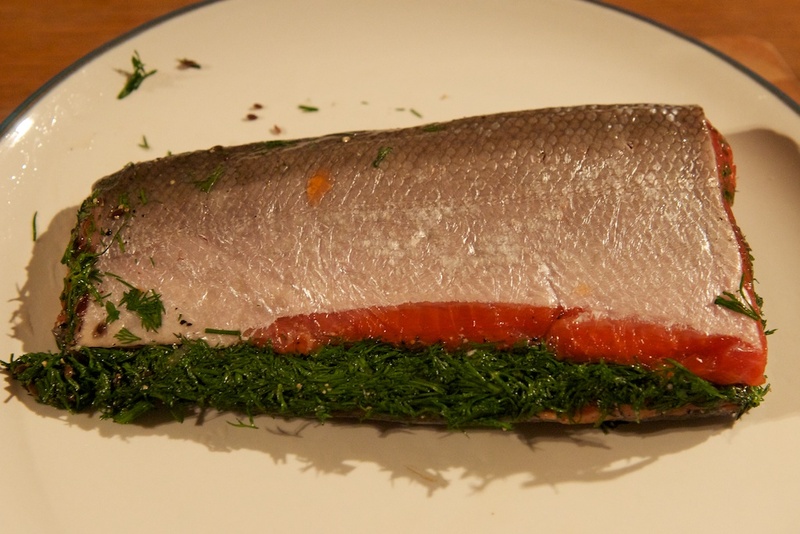 The idea of curing your own fish can sound a bit scary, but it really is worth making your own gravadlax. It will beat the pants of anything you buy in a supermarket. Try it! 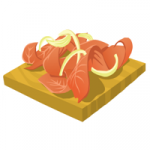 This entry was posted in Meals and tagged lemon, onion, salmon by dopiaza. Bookmark the permalink. I love this blog! Going to try making ‘Lotsa Lox’ next week, and I’m so excited! Thank you! Glad you like it – I really do need to get back into the swing of posting to it! I just linked it on Global, so you might get an influx! Would love to see more recipes. If some random Glitchen (moi!) can help in any way, please let me know!